Factual error: At the end when the shark is attacking the boat and the electronic device is used you can hear the shark roar. Sharks cannot produce this sound since they have no vocal cords. Continuity mistake: Michael Caine is knocked overboard into the water, but manages to climb back into the boat - when he reaches the deck, his clothes are perfectly dry. Continuity mistake: Throughout the entire film, Ellen Brody's hair changes back and forth from blonde to white. Revealing mistake: During the scene on the banana boat, the woman who is attacked by the shark quite deliberately shoves her leg into the fake shark's mouth as it missed her when it came up out of the water. Suggested correction: She doesn't put her foot in its mouth. She instinctively tries to kick it or she's just unlucky with where she moves her foot. She put her leg in the shark's mouth. It's too obvious even without slow motion. Revealing mistake: When the shark is attacking someone under the water you can see a hole in the shark and divers fins showing that it's a puppet. Factual error: The shark follows Brody into the sunken ship (yeah, right) and eventually the chase ends with the shark at the end of a very narrow passageway, with no room for it swim further forward, and no room to turn. Since the rigid nature of a shark's pectoral fins means that they cannot swim backwards this one would be stuck. And since Great White sharks have to constantly swim in order to breathe, the movie really should have ended right there. Revealing mistake: During the sequence when Michael has his underwater motorcraft and the shark attacks him, you can see in certain long shots the machine which works the shark protruding from under its tail. Continuity mistake: When Mike sees through the binoculars that his mom is walking with hoagie sandwich, you can see she is wearing white shoes. However, when it cuts to the next shot she is barefoot. Continuity mistake: In one of the final scenes in which the shark is attacking, the colour of the water is not consistent in the background. In one scene it is light blue, and in the other it is much darker blue. Continuity mistake: The transmitter device that Jake attaches to the shark is missing between shots during the entire movie. There are two different endings to this movie. 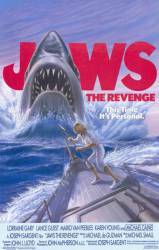 In the first one (released on video and DVD in the US), the shark (inexplicably) explodes after being rammed by the boat and sinks to the bottom in a reuse of footage from "Jaws." When the camera cuts back to the survivors floating in the water, we see that Mario Van Peebles, though badly wounded, is alive after all. In the second ending (which can be seen on American Movie Classics in the US), Mario Van Peebles does not survive his fall off of the boat; when he falls, he lands in the shark's mouth and is killed. Also, when the boat rams into the shark, it does not explode but is more "realistically" impaled, blood pouring from its mouth as it dies. After the survivors are knocked off the boat, there is a shot of ship and shark sinking to the bottom, prow of the ship stuck in the side of the shark.